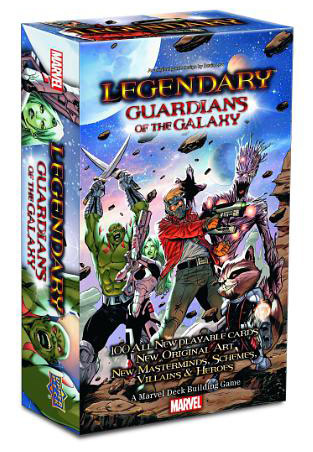 "Marvel's 'Guardians of the Galaxy' was one of the biggest blockbusters of the summer, and with that, Legendary™ fans have been inquiring about when they could add content of this misfit band of interstellar heroes to the game," said Jason Brenner, Upper Deck's manager of entertainment brands. "We couldn't be more excited to give our fans what they want. Not only will the cards be a great addition to the game, but the original artwork really makes this set stand out." Upper Deck, headquartered in Carlsbad, Calif., is a worldwide sports and entertainment company built on the pillars of quality craftsmanship, authenticity and innovation with a dedication to creating products that turn memorable moments into collectibles. Upper Deck revolutionized the sports trading card experience with anti-counterfeit holograms, high quality card stock and stunning photography in its inaugural 1989 baseball set, and since then its mission has been to capture the excitement of the game and deliver it to fans of all ages. The cornerstone of Upper Deck's business, which opened in 1989, is based on sports trading cards. As its brand has evolved to include other products over the years, the company now creates exclusive memorabilia, gaming and entertainment products, collectible cards and a wide array of sports and entertainment trading cards. Find more information at www.upperdeck.com, www.UpperDeckBlog.com or follow us on Facebook (UpperDeck), Twitter (@UpperDeckEnt), and YouTube (udvids).